When Patrick asked Millie to marry him, he decided to make sure their wedding was first class and that he didn't miss a beat. 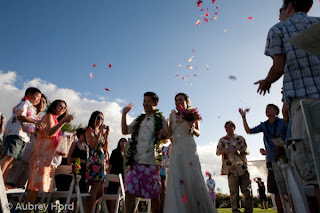 First of all, they decided to get married up at Maui's premier wedding site, Molokini Lookout, above Gannon's Restaurant in Wailea. 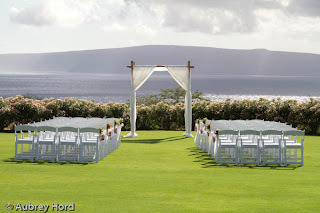 The view is spectacular from the private venue overlooking the islands of Molokini and Kaho'olawe. 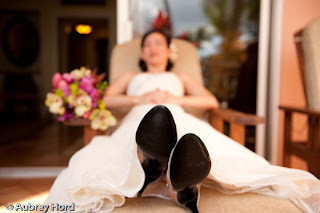 Secondly, they hired Laurie Terry from Makena Weddings to be their wedding planner, making it easy for them to relax and enjoy their day. Thirdly, they bought out the newest restaurant run by renowned chef, Bev Gannon, aptly named Gannon's, down in Wailea (it used to be known as the Seawatch) so they could enjoy the evening with their guests overlooking the sunset and Pacific Ocean. Finally, they decided to fly in musician Alika Nako'oka and his band from Seattle (originally from Maui) for an evening of incredible music. 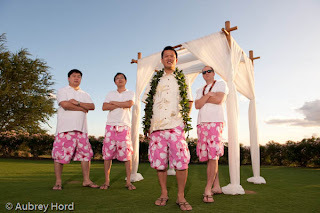 They decided to stay at the Grand Wailea with all of their guests who came from all over the world. The beautiful property is located right on the beach and has grounds that are a tropical paradise with an amazing spa. Perfect for a bridal party! 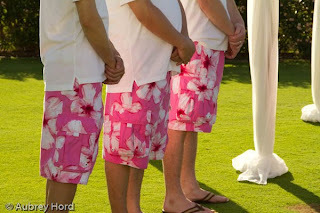 The groomsmen went tropical, wearing pink Hawaiian print board shorts with the bridesmaids wearing coordinating pink dresses. Great color combination for photos with the blue ocean background! 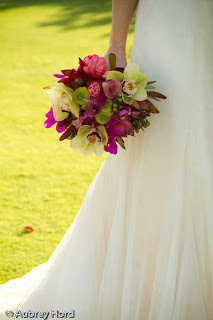 The bride and groom were showered with flowers on their way back down the aisle to rousing applause from their guests! Our team of included lighting assistant, Nicole Angel, veteran celebrity photographer, Frank DiMarco, who flew in from Portland to shoot the wedding with me and Maui's rising star, 16 yr old photographer, Zach Pezzillo, who captured amazing detail and beauty in every shot. Thanks Team! 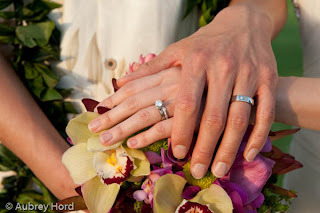 I look forward to my next wedding up at Molokini Lookout. Wow! What a view! Congratulations and best wishes to a first class couple - Millie and Patrick! Thank you Aubrey, Nicole, Zach and Frank from the bottom of my heart; we will cherish these photographs for a life time! 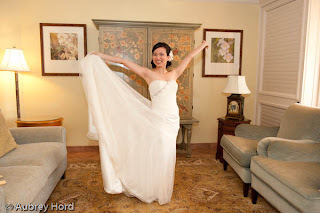 You made us look beautiful and told a wonderful story about our wedding day! The truth is that we never saw you on our wedding day; you guys had captured unexpected images. It was a treat to have first class team to photograph our wedding. Enlarged Reality capacities in gadgetry has seen a truly fast development over the most recent couple of years, the oddity of seeing yourself holding a light saber, or even virtual pets on the kitchen table never appears to wear off!